Always one of our favorite months of the year! Here's a start for all the fun events during Earth Month 2018. All these and more are on the Conservation Calendar hosted by UM's Environmental Studies program. April 14 - Run for the Trees. Support our Urban Forest - 5K and 10K races. Details here. April 17: 2:15pm. Check out Tipping Point - a cool film about Kids and Climate in the Conservation Nation short block. April 18: 6:15pm. An entire film "block" all about plastics. We really can live without them! April 17 - Five on Black Fundraiser for Climate Smart! 3 - 8 pm, either downtown or Reserve St. MENTION CLIMATE SMART and 1/2 the proceeds come our way. You gotta mention us! April 20 - The Missoula Nature & Energy Art Expo. Imagine Nation Brewing. 5 - 8 pm. A cool new event! 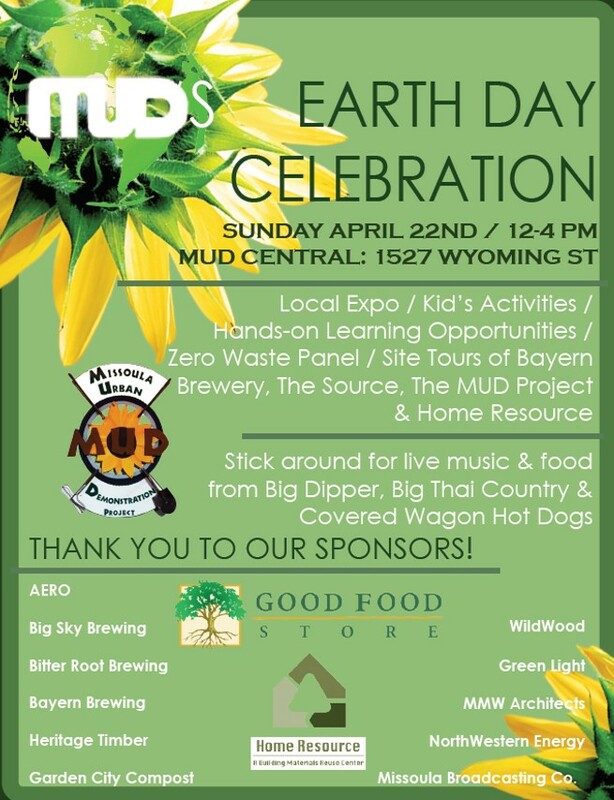 MUD's Earth Day Celebration. 12 - 4pm. At the MUD site on Wyoming St. Come by and visit Climate Smart's table . Check out solar ovens (and hope for sun). See schedule, right. April 27 - State Arboretum Celebration at UM. April 28-29 - Annual Missoula Bike Swap. Drop bikes on Saturday, sale on Sunday. Details soon as we figure out where! We had such a great time at MUDs Earth Day Celebration. Check out the Photos from Earth Day 2018 and get inspired!